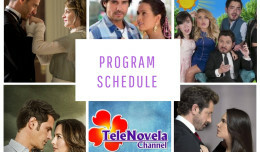 The Two Sides of Ana: Episodes 68 | TeleNovela Channel - Bringing you closer to lifes drama. Claudia tells Graciela how disappointed she is for believing Irene’s lies. Claudia reproaches Irene for all her evil schemes and later complains that she is having labor pains. Irene decides not to take Claudia to the hospital because she refused not to tell Rafael about the situation. Meanwhile, the jury and judge rule in favor of Ana and declare her innocent. A taxi driver takes Claudia to a hospital while Irene follows.